Microscopy live-cell imaging requires maintaining the cells in a controlled environment and in particular to control cell temperature. There are several temperature controllers available on the market, they all have advantages and caveats and depending on the experiments some might be better suited than others. Some systems take advantage of technology with peltier devices to ensure precise temperature control. How do Peltier elements work? Peltier devices are thermoelectric devices acting as a heat pump. It is composed of a hot plate and a cool plate connected by thermo couple. When electricity flows through, the system will transfer heat from one side to the other. The hot side further is connected to heat-sink so it can remains at ambient temperature allowing the cool side can reach very low temperature. In biology, Peltier elements are best known for their use in PCR machine to ensure fast temperature-switch. 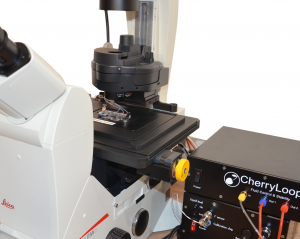 In microscopy imaging, they are integrated in temperature controllers system in which they offer several advantages, particularly to thermalize below the room temeprature. The clear advantage of Peltier devices is the possibility to reach below ambient temperature. The best Peltier devices have a large temperature range from -196°C-600°C. Peltier used for microscopy imaging can go between -5 to 60°C. Peltier devices are very precise, temperature is reach with a +/- 0.1C precision and temperature is tighly maintained. Used in microscope stage heater and in the CherryTemp microfluidic technology to ensure fast and precise temperature switch. Peltier elements can also be used in perfusion system as heating or cooling devices for the perfused solutions. Peltier elements ensure a very fast temperature switch. In the CherryTemp system, we used two Peltier devices whose temperature are pre-set according to user experimental needs, hence switching from one temperature to another is even faster! There are no disadvantages per se in Peltier elements, their limitation comes from the system they are integrated to. It’s crutial to consider how the initial calibration is performed.